Terms On A Food Label: What Do They Mean? HomeTerms On A Food Label: What Do They Mean? Healthy eating has never been easier, thanks to the food nutrition label. Most foods in the grocery store have a nutrition label and an ingredient list. Claims like “low cholesterol” and “fat free” can be used only on a label if a food meets legal standards set by the government. Reading the nutrition label can help you choose foods that make up a healthful diet. Eating a healthful diet can help reduce your risk factors for certain diseases. For example, too much saturated fat and cholesterol can possibly raise blood cholesterol (a risk factor for heart disease). Too much sodium may be linked to high blood pressure. High blood pressure is a risk factor for heart attack and stroke. Being healthy daily is up to you. In addition to eating a balanced, nutritious diet daily also stay active, do not smoke and watch your weight. Here is a chart which provides some key words and health claims on product labels, and what they mean as defined by the government. Remember that the information shown in these panels is based on 2,000 calories a day. You may need to consume less or more than 2,000 calories depending upon your age, gender, activity level, and whether you’re trying to lose, gain or maintain your weight. 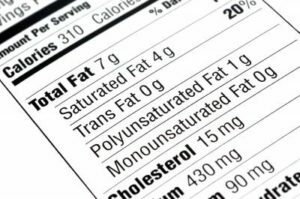 When the Nutrition Facts label says a food contains “0 g” of trans fat, but includes “partially hydrogenated oil” in the ingredient list, it means the food contains trans fat, but less than 0.5 grams of trans fat per serving. So, if you eat more than one serving, you could quickly reach your daily limit of trans fat. Be careful!